At the center is the Light of the World, God the Holy Spirit, and Jesus with Mary in the loving, caring, nurturing and protecting character of the Mother of Jesus. 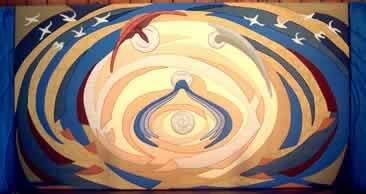 The sweeping, curved shapes represent the arms of Mary blending into the shape of St Mary's Haven and the sea. Boat sails are caught in the power of wind and wave and overhead fly twelve gulls (the Apostles). Blues represent Mary and the sea, while gold symbolizes the glory of God and his creation. Silver is used to signify light. The Lectern Fall was designed to complement the reredos. The four gulls in this case represent the four Evangelists.